This book is by the vocal pedagogue, Berton Coffin and is a technical book rather than an actual course of voice teaching. Coffin seems to have learned from and been inspired by the teachings of Russian born coloratura Paola Novikova (1896 � 1967) so the book starts with an introduction by Nicolai Gedda (one of her pupils) and a 27 page chapter on her teachings. This chapter consists principally of her sayings on various topics plus some exercises - perhaps rather dangerous on their own but useful if worked through with a singing teacher. This book is Coffin�s attempt to codify his method of vocalisation based on principles derived from the physiognomy of and the nature of sound in the human throat. The book comes with a rather fearsome Chromatic Vowel Chart which is used as the basis for the vocalisations that Coffin suggests. To use the Vowel Chart you need to become familiar with the phonetic system that Coffin uses and this system is cross-referenced to two other books by Coffin. To progress quickly, Coffin suggests using something that he calls a Vowel Resonator. This involves using a small electronic keyboard with a speaker placed in front of the mouth. The author has a great belief in the ability of this device to help with the correct placement of the voice. 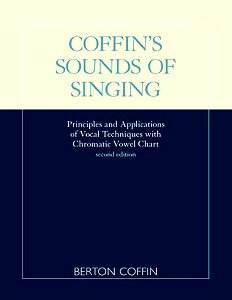 Whilst you cannot teach (or learn) singing from a book, Coffin feels that with the aid of his Chromatic Vowel Chart, Vowel Resonator and the exercises detailed in the book, he can teach you to place your voice correctly. It is an attempt, using musical notation and phonetics rather than absolute frequencies, to implement knowledge of the voice and throat gained from a sound engineer�s point of view. The result is a highly technical book and one that requires reading from cover to cover before you can start implementing much of the work. I feel that the book would probably be of most use to an interested singing teacher as a way of providing a different light on their own methods. As an amateur, I would be very wary of attempting to alter my voice production using the book without the help of a sympathetic singing teacher as well.